! Approximately 67% (4.41 billion board feet) of solid wood material utilized in the production of pallets and containers in 1999 was hardwoods.
! Nearly one-third (2.13 billion board feet) of solid wood material used by the pallet and container industry in 1999 was softwoods.
! An estimated 289 million square feet of wood panels was used in the manufacture of pallets and containers in 1999.
! Approximately 299 million pallets were recovered by the industry in 1999.
! Pallet and container manufacturers continue to purchase and utilize mixed hardwoods more than any other species or species group.
! Increased use of softwood parts represented the largest change in solid wood consumption, from 254 million board feet in 1995 to 610 million board feet in 1999.
! While softwood plywood continues to be the most utilized panel product in the industry, oriented strand board (OSB) consumption increased from 30 million square feet in 1995 to approximately 77 million square feet in 1999.
! Recovered wood use among pallet manufacturers increased from nearly 2.3 billion board feet in 1995 to approximately 4 billion board feet in 1999. The wood pallet and container industry is a vital consumer of wood in the U. S. This industry provides a much-needed market for wood materials, especially lower grade hardwoods. In 1995, it was estimated that the industry utilized over 6.3 billion board feet of wood in the form of lumber, cants, and parts (Reddy et al. 1997). An estimated 4.53 billion board feet of this was hardwood, which was equivalent to 38% percent of the annual U.S. hardwood lumber production and an even greater percentage of low-grade hardwood production. Softwood consumption was estimated at 1.79 billion board feet or 5.6% of U.S. softwood lumber production in 1995 (Bush and Araman 1998a). In addition, the industry used approximately 208 million square feet (3/8" thickness basis) of oriented strand board and softwood plywood in 1995 (Reddy et al. 1997).The pallet industry recovers a significant amount of its own wood materials, thus playing an important role in efforts to conserve natural resources and reduce the amount of waste sent to landfills. In 1995, it was estimated that the pallet industry recovered 171 million pallets, containing 2.6 billion board feet of wood material (Bush et al. 1997). From these recovered pallets and their parts, approximately 139 million pallets were repaired or recycled and returned to service. Additional uses for recovered pallets included fuel, animal bedding, landscape mulch, and furnish for fiber-based products. Fewer than 1% of the pallets recovered were sent to landfills. Due to the large quantities of new and recovered wood materials utilized by the pallet and container industry, minor shifts in this industry's wood usage patterns affect many segments of the forest products industry. A study conducted previously by Virginia Tech revealed that the pallet and container industry's consumption of new wood materials was stagnant to declining (Reddy et al. 1997) during the early 1990s. It was believed that this downturn in new wood consumption was due, in part, to the growth in pallet repair and recycling (Bush and Araman 1997). Today, there are many factors impacting the industry's use of wood materials, in addition to pallet repair and recycling. This paper provides the results of a 1999 study that provides the pallet and container industry and its wood material suppliers with updated data regarding wood use trends. Companies can position themselves to exploit these developments by updating their business strategies and capital investment plans.
! and identify trends in new wood use for pallets and containers and in wood recovery from these products. Respondents reported their primary business to be one of six types: new pallets and skids (61% of respondents), repaired/recycled pallets and skids (25%), containers (7%), pallet parts (2%), broker of pallets and skids (1%), and other (4%). Many respondents indicated that they were providing information for more than one production facility. In total, this study captured information for 838 manufacturing facilities. Respondents reported having 21,043 employees, or nearly 41% of the industry's actual employment figure of 51,443, as estimated by the U. S. Department of Labor (Bell 2000). The greatest number of employees was reported in the South (9,242), followed by the Midwest (6,759), Northeast (2,995), and West (2,047) (Figure A). Perhaps the most important finding was that nearly 41% of the industry is employed in the South and another 32% is employed in the Midwest (Bell 2000). Approximately 67% of all solid wood materials utilized in the production of pallets and containers in 1999 was hardwoods. The industry consumed an estimated 4.41 billion board feet of solid hardwood materials that year. Roughly 3.7 billion board feet of this was in the form of lumber and cants. The remaining 707 million board feet was hardwood parts. Approximately 51% of the hardwood used by the pallet and container industry in 1999 was either bought or processed as a mix of hardwood species. This was calculated to be nearly 2.26 billion board feet. Oak (red and white) made up nearly 31% of the hardwood used by the industry with an estimated 1.35 billion board feet consumed. Other species used included yellow poplar (11%) and alder (2%). A number of different hardwood species were listed as Other and accounted for another 234 million board feet. Approximately one-third of the solid wood used by the pallet and container industry in 1999 was softwood. Softwood consumption was estimated at 2.13 billion board feet. Roughly 1.52 billion board feet of softwood was in the form of lumber and cants. Softwood parts accounted for approximately 610 million board feet. Nearly half (48%) of the softwood consumed by the pallet and container industry in 1999 was Southern Pine; it was estimated that the industry utilized approximately 1 billion board feet in 1999. Spruce-Pine-Fir was the next most utilized softwood species or species group (25%), at an estimated 539 million board feet consumed. Other species estimates included Hem-fir (11%) and Douglas-fir (10%). The remaining softwood species combined to account for 6% of use by the industry. Due to the time required of the respondents to convert their wood panel use to 3/8-inch basis or to give the volume breakdown for each thickness, respondents were asked to simply list each panel thickness used. Frequency of use was used to gain a general understanding of the most common thickness used for each panel type. The most frequently reported thickness used for oriented strand board was 7/16-inch (38%) followed by 3/4-inch (16%). Thirty percent of firms using softwood plywood reported using it in �-inch thickness. Other common sizes were 3/4-inch and 5/8-inch. Half-inch was the most commonly reported thickness for hardwood plywood at 37% followed by 3/4-inch (21%). Through the extrapolation of the mean production per employee, it was estimated that the pallet and container industry produced approximately 429 million new pallets in 1999 (Figure C). In an effort to determine the differences between pallet and skid production, respondents were asked to provide their production numbers for each. Extrapolation of the individual figures showed that new pallet production was considerably higher than new skid production. Roughly 80% of the pallets produced in 1999 were the stringer type and 12% were the block type. An estimated 182 million multiple-use stringer pallets were produced in 1999, which made it the most manufactured pallet type. The next most produced pallet type was limited-use stringer, at nearly 161 million pallets produced. Limited-use and multiple-use block pallet production were estimated at 26 million and 25 million, respectively. Approximately 35 million other pallet and skid types were produced. Panel-deck pallet and skid production in 1999 was estimated at 6.7 million and 0.5 million, respectively. These estimates were derived using the same extrapolation method (employee basis) used to calculate pallet production and material use. Given these numbers, panel-deck pallets and skids represent less than 2% of the industry's total pallet and skid production. It was estimated that the 299 million pallets recovered by the pallet industry in 1999 included 196 million multiple-use grocery pallets, 51 million other multiple-use pallets, 35 million limited-use, and 16 million skids and other types of pallets. Volume estimates for repaired and recycled pallets were calculated based on the number and type of pallets received. Virginia Tech's William H. Sardo Pallet and Container Laboratory estimated board footage for each pallet type: limited-use (10.1 bf), multiple-use grocery (15.8 bf), other multiple-use pallets (18.5 bf), and other pallet types (15.1 bf) (Hansen et al. 1994). These board footage estimates were used in subsequent volume calculations regarding pallet repair and recycling. The estimated 299 million pallets recovered by the pallet industry were calculated to be equivalent to 4.46 billion board feet of wood material. It was estimated that 69% of the pallets recovered by the pallet and container industry in 1999 were repaired and then sold or reused. This equates to approximately 207 million recovered pallets . Of the 48 million recovered pallets that were un-nailed, 87% were used to repair or manufacture other pallets and 10% were ground or chipped. In addition, it was estimated that 25 million pallets were reused or sold without repair and another 16 million pallets were ground or chipped. Fewer than 1% of the total recovered pallets were sent to landfills or used for other purposes. Approximately 92% of the wood material recovered by the pallet industry, or 4.1 billion board feet, went back into pallet production. This estimate includes pallets that were repaired and then reused or sold, sold or reused without repair, and un-nailed for use in the repair or manufacture of more pallets. The pallet industry returned nearly 218 million pallets to service in 1999 through either repair or recycling. However, estimates regarding the repair or recycle (remanufactured using recovered parts) of pallets may be somewhat misleading since it is possible that some pallets were recovered and repaired or recycled more than once during the year, and consequently were counted multiple times. At an estimated total volume of 303 million board feet in 1999, grinding or chipping pallets or un-nailed pallet parts is another major use of recovered pallets. It was estimated that more than one-half of the pallets ground or chipped by the pallet industry went into the production of landscape mulch. Approximately 6.8 million pallets were used to produce colored mulch and another 4.4 million were ground into uncolored mulch. The volume estimates for these two uses were 100 million and 65 million board feet, respectively. Approximately 4.7 million ground or chipped pallets, with an estimated volume of 69 million board feet, were used as fuel. Ground or chipped pallets were used in smaller quantities for furnish in fiber-based products, animal bedding, and other purposes. Perhaps the most significant of recent developments in the U.S. pallet and container industry is the acceptance of third-party management systems. These organizations manage their clients' pallet and container needs, often relieving them of such handling problems as sorting, cleaning, repair and disposal. One type of third-party management involves pallet users buying into a pool of pallets that is shared by many users. The pallet pool is then managed to maintain quality. In another form of third-party management, companies rent or lease pallets to users who, typically, use them in a closed loop distribution system that facilitates recovery. Used pallets are exchanged for reconditioned pallets at one of the third party's depot centers. Commonwealth Handling Equipment Pooling (CHEP) is perhaps the most recognized third-party pallet management firm, operating in more than 36 countries and controlling more than 134 million pallets and 20 million containers (CHEP 2000). All indications point toward a growth in rental pallets. In a 1998 National Wooden Pallet and Container Association survey, 20% of respondents said they used or intended to use rented pallets (McCormick 1998). Just two years earlier only 7% answered the same. Various reasons are given for this change in position: potential cost savings, higher quality pallets, lower pallet inventory, reductions in pallet storage space, elimination of disposal problems, and a concern for the environment and natural resources (Mapleston 1998). In addition, CHEP and the Reusable Plastic Container Coalition (RPCC) have lobbied for the elimination of state sales taxes on rental pallets based on environmental benefits (LeBlanc 2000). Sales taxes on rental pallets in Florida and California were eliminated due, in part, to their efforts. The Reusable Plastic and Container Coalition also has lobbied the federal government for tax breaks, such as tax credits for users of rental pallets and containers.
! Public concerns over the capacity and cost of landfills have resulted in some facilities banning pallets. Repaired and recycled pallets appear to be increasingly satisfying new demand for wood pallets In 1995, 171 million pallets were recovered by the pallet and container industry, up from 83 million in 1993 and 66 million in 1992 (Hansen et al. 1994, Christoforo 1993). 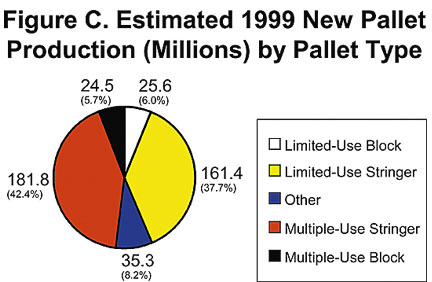 In 1999, 299 million pallets were recovered. Accordingly, the amount of wood recovered from recovered pallets increased by a factor of four during the 1990s. These gains in recycling appear to have come at the expense of new wood use in pallet production (Bush and Araman 1997). In 1992, only 13% of the wood used by the pallet industry was recovered material. In 1999, approximately 36% of the industry�s demand for solid wood was satisfied by recovered material. Although wood pallets currently dominate the market, pallets made from various other materials are finding and filling niches. Some of these alternative materials include plastics, corrugated paperboard and metal. Often, pallets made from these materials differ from wood pallets on cost, durability, strength, stiffness, and functionality. Of all materials used in the manufacture of pallets, plastic may be in the best position to make inroads on wood's hold on the market. Plastic pallets were once thought of as being too weak structurally to justify their high cost. Where a traditional wood pallet costs less than $10 dollars, plastic pallets can reach over $100 (Madl 2000). Today, with advances in plastic formulation and the formation of closed loop distribution systems, the use of plastic pallets has become much more cost effective. In some situations, the additional cost of plastic pallets is thought to be recouped through decreased costs related to repair, fumigation (when used for exports), and sorting (Forcinio 2000). Heat treating requirements for wood pallets may further change the perceived advantages of the two materials. Several studies predict growth in the use of plastic pallets. Plastic Custom Research Services (PCRS 2000) estimated that the annual production of plastic pallets increased by approximately 3 million from 1994 to 1999, representing a 15.5% annual growth rate. Furthermore, the report predicted growth of plastic pallet production at 6.5% annually from 1999 to 2004. If this estimate holds true, plastic pallet production in 2004 will reach approximately 8.25 million. In a 1994 Virginia Tech study of wholesalers and retailers, 22% of the respondents indicated that they used plastic pallets (Engle 1994). This number was projected to increase to 37.5% by 1997. As material handling becomes more automated, the exacting specifications to which plastic pallets can be manufactured might act as an incentive for some users to switch from wood to plastic. Inconsistent quality in wood pallets has caused problems for such automated systems and resulted in either system failure or product damage (Scheerer 1997). It should be noted, however, that inexact dimensions and poor quality are not inherent characteristics of wood pallets. Wood pallet quality can be improved and such improvement may be required if the product is to maintain its dominant position in the market.
! and plastic pallet research and development.
! limited capabilities of plastic pallets. (Editor�s Note: Jeffery Bejune is a former graduate research assistant in the Department of Wood Science and Forest Products at Virginia Tech, now employed by the U.S. Forest Service. Robert Bush is a Professor with the Department of Wood Science and Forest Products at Virginia Tech. Philip Araman is a Project Leader the U.S. Forest Service Southern Research Station. Bruce Hansen is a Project Leader with the U.S. Forest Service Northeastern Research Station. Dan Cumbo is Research Associate and Market Analyst for the Virginia Tech Center for Forest Products Marketing and Management. Bell, B. 2000. Department of Labor: Bureau of Labor Statistics. Unpublished employment data provided to the U.S. Forest Service. Brindley, E. 2000. Core Supplies-What is going on? Pallet Enterprise 20(11):44-55. Brindley, E. 1999a. NWPCA gathering helps industry address issues, plan for change. Pallet Enterprise 19(4):44-47. Bush, R.J. and P. Araman. 1998a. Changes and trends in the pallet industry. Hardwood Market Report 76(9):11-13. Bush, R.J. and P. Araman. 1998b. Changes and trends in the pallet industry: recovery and recycling. Hardwood Market Report 76(10):13-16. Bush, R.J. and P. Araman. 1997. Recycling growth reducing pallet industry's need for new wood. Pallet Enterprise 17(8):61-66. Bush, R.J., E. Hansen, and P. Araman. 1994b. Proceedings of the 1994 Forest Products Society Southeastern section workshop on environmental quality in wood processing. Atlanta, GA.
Bush, R.J., V.S. Reddy, M.S. Bumgardner, J.L. Chamberlain, and P.A. Araman. 1997. Recycling in the U.S. Pallet Industry: 1995. Center for Forest Products Marketing, Virginia Polytechnic Institute and State University, Blacksburg, VA. 19 pages. CHEP. 2000. CHEP Equipment pooling systems. October 9, 2000. Christoforo, J.C. 1993. Wood based material use in the United States pallet and container industry. Masters Thesis. Virginia Polytechnic Institute and State University, Blacksburg, VA. 106 pages. Engle, C.A. 1994. Factors influencing pallet material substitution by the U.S. grocery distribution industry: 1994. Masters Thesis. Virginia Polytechnic Institute and State University, Blacksburg, VA. 192 pages. Forcinio, H. 2000. Cutting pallet expenses. Candy Industry 165(2):48. Hansen, E., R. Bush, and J. Punches. 1994. Recycling in the U.S. pallet industry: 1993. Center for Forest Products Marketing, Virginia Polytechnic Institute and State University, Blacksburg, VA. 15 pages. Le Blanc, R. 2000. Third-party patchwork will accelerate paradigm shift. Pallet Enterprise 20(3):15-25. Madl, L. 2000. Picking a pallet. Food Processing 61(2):79. Mapleston, P. 1998. Plastics set to take a share of the market from wood pallets. Modern Plastics 75(7):68-71. McCormick, B. 1998. Can pallet leasing make your company more competitive. Frozen Food Digest 14(1):10. [PCRS]. Plastics Custom Research Services. 2000. A PCRS Plastics Industry Report. PCRS, Advance, NC. pp. 30-33. Reddy, V.S., R.J. Bush, M.S. Bumgardner, J.L. Chamberlain, and P.A. Araman. 1997. Wood use in the U.S. pallet and container industry: 1995. Center for Forest Products Marketing, Virginia Polytechnic Institute and State University, Blacksburg, VA. 17 pages. Scheerer, C. 1997. Grocers prefer plastic when they shop for pallets, survey shows. Pallet Enterprise 17(9):34-39.